Mecalux has equipped the JCH warehouse in Barcelona (Spain) with an AS/RS for boxes that offers a storage capacity of 4,076 boxes. In addition, there is a conveyor circuit and three picking stations installed (one is also used for replenishment). The supply includes the Easy WMS warehouse management software, which ensures maximum productivity when preparing orders. JCH is the leading manufacturer of air conditioners worldwide. It started up in 1910 as a repair shop for electronic equipment and, at present, has established itself as one of the most technologically advanced companies in the sector. The company is committed to improving the well-being of its community through its high-quality products. In this respect, its involvement in environmental protection stands out, with them developing energy efficient technology and promoting reuse and recycling. JCH needed a solution to house the smaller products in its component warehouse –located next to its Barcelona production center–, as well as a system to prepare orders as quickly as possible. Keeping JCH’s requirements in mind, Mecalux installed an automated warehouse for boxes where two different models co-exist: on one side, 32" x 24" x 16.5" boxes and, on the other, 24” x 16” x 9.5” ones. The miniload installation makes full use of the available area to top out storage capacity, in addition to being an automated system that provides streamlined picking. 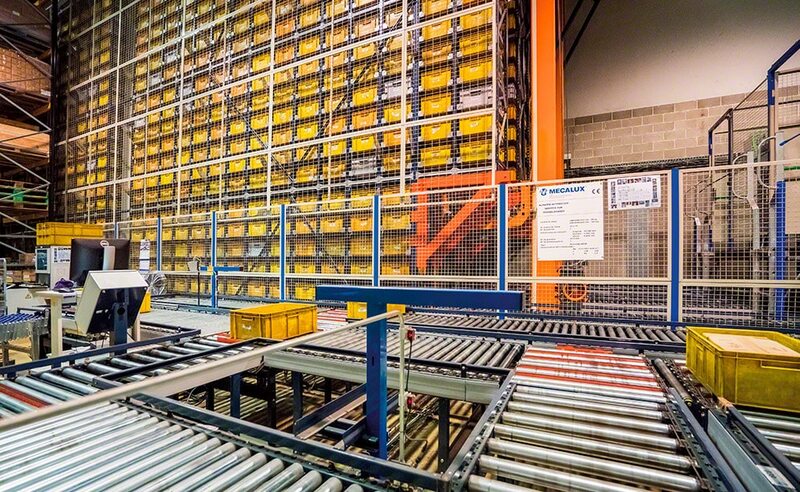 At the front of the warehouse, there is a conveyor circuit that connects the storage aisles to the three picking stations. Both conveyors and picking stations are specifically designed to operate with the two different box models. It comprises two aisles with single-depth racks on both sides that are 112’ long and 26' high. Larger boxes are deposited in one of the aisles that is 14 levels high, and smaller ones in the other that has 21 levels. In each one of the aisles, a twin-mast miniload stacker crane circulates, whose task is to carry out the inputs and outputs of the goods automatically. These machines operate at a travel speed of 820 ft/min and 295 ft/min when elevated. Both miniload installations incorporate a double extraction system capable of handling two boxes at a time. Each stacker crane is adapted to the box sizes it operates with: one of them can move two 110 lb boxes and the other, two weighing 220 lb. In front of the AS/RS for boxes, a roller conveyor circuit has been installed, moving at a speed of 82 ft/min. Its function is to displace the merchandise from the warehouse to the picking stations. The recirculation of the boxes is facilitated by its double circuit design. Two U-shaped picking stations are set up perpendicular to the main circuit. Picking is done via the product-to-person principle, in other words, the stacker cranes provide the merchandise to the operators automatically. The operators then extract the items indicated on a screen by the system and deposit them into the corresponding order. On one of the sides of the warehouse, there is a third picking station that also carries out replenishment tasks. It has the necessary equipment to do the job, such as a scale, a scanner and a computer. The JCH miniload AS/RS for boxes is managed by Mecalux’s Easy WMS warehouse management software, which controls and coordinates its operation at all times. It is a very efficient system, which performs various functions, among which is the assigning of locations and storing of boxes, removal of the goods, and order picking. Moreover, the Mecalux Galileo control module is responsible for directing the maneuvers performed by the moving warehouse devices, such as the two miniload stacker cranes and the conveyor circuit. High storage capacity: the AS/RS miniload for boxes reaches a 4,067 box capacity. Boosted picking speeds: the miniload and the picking circuit optimize the movements of the operators during picking tasks. Smart management: the Mecalux Easy WMS warehouse management software and the Galileo control module are capable of organizing the processes and operations carried out in the warehouse.